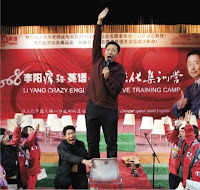 Everyone (my mistake), Anyone... should take some time to observe this phenomenon of Li Yang, one man hired by the Chinese to improve standards of spoken English in China for the Olympics. My experience with my Chinese friends reveals a common problem - they're all fantastic with the rudiments of the language (I've been asked on many occasions to help vet their work), but extremely low in confidence in its utility in day-to-day conversations. Now check out what China has been doing about this. Like anything in China, we're talking about en masse, and a little big to fathom easily. Inspired by the religious evangelists from the US, Li Yang adapted the method to appeal to Confucianist Chinese, getting students to dig deep into their loyalties and love for family and country to instigate a will beyond common means to well, in a word, conquer the language as if it were a battle. Li peered at the students and called them to their feet. They were doctors in their thirties and forties, handpicked by the city’s hospitals to work at the Games. If foreign fans and coaches get sick, these are the doctors they will see. But, like millions of English learners in China, the doctors have little confidence speaking this language that they have spent years studying by textbook. Li, who is thirty-eight, has made his name on an E.S.L. technique that one Chinese newspaper called English as a Shouted Language. Shouting, Li argues, is the way to unleash your “international muscles.” Shouting is the foreign-language secret that just might change your life..."